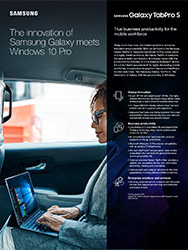 The innovation of Samsung Galaxy meets Windows 10 Pro. True business productivity for the Mobile Workforce. A brochure which details the specifications for the SSD PM863 and SM863 for Data Centers. The brochure conveys the importance of data reliability and security. The new Samsung displays helped the Department of Construction Science create a BIM CAVE that is unmatched by any other U.S. university. Students are able to use the stateof- the-science BIM CAVE to simulate complex construction projects. The department has seen a marked uptick in student interest in its construction engineering program. Secure access to endless content from the palm of your hand. Intelligent operation, seamless communication and crystal clear content. Easy to use, space-saving printers built for reliability and productivity. Handle workloads with speed, reliability and performance. Welcome to Wholesale Computer Exchange. We partner with Samsung Business, a global leader in enterprise mobility and information technology. Samsung Business provides a diverse portfolio of enterprise technologies including tablets, digital displays, hospitality TVs, and printers. Together, we are committed to putting the business customer at the core of everything we do by delivering comprehensive products, solutions and services across diverse industries including hospitality, education and government. Samsung Business is committed to helping customers realize the promise of a digital business. Video: What is Samsung's SMART Signage TV (SSTV)? Contact us today if you have questions about our products and services. A representative from Wholesale Computer Exchange will respond as soon as possible with answers to your questions. Showcase Content © Samsung 2016. All rights reserved. Showcase and Syndication technology powered by Zift Solutions™ 2016. All rights reserved.